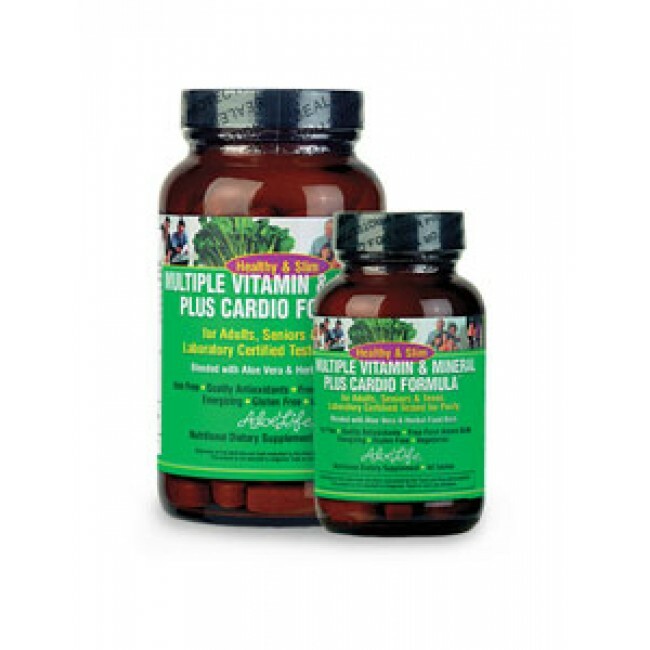 Multi Vitamin & Mineral Plus Cardio Formula is an exceptional blend of health enhancing vitamins, minerals and heart healthy nutrients. Unlike other one per day multiples that are low potency and often made from synthetic ingredients Aloe Life blends only 100% natural ingredients that support the body to feel terrific - especially when coupled with smart food choices in the daily diet. Great for Adults, Seniors, and teens! Supports the body to look and feel its best; Energy, and overall body wellness. Healthy and Slim Multiple Vitamin & Mineral Plus Cardio Formula is an exceptional blend of health enhancing vitamins, minerals and heart healthy nutrients. Unlike other one per day multiples that are low potency and often made from synthetic ingredients Aloe Life blends only 100% natural ingredients that support the body to feel terrific - especially when coupled with smart food choices in the daily diet. Great for Adults, Seniors, and teens! Gluten Free and Iron Free * in a food base which is high in nutritional coverage with excellent absorption from Aloe Vera, Alfalfa, and nutritional yeast. Packed full of nutrients including D3, natural B-Complex, Chromium GTF (Glucose Tollerance Factor) and Antioxidants including ACE, Selenium, CoQ10, Garlic and the highly researched Resveretrol, Curcumin and L-Carnitine that support heart health and more! Great for those with special allergy restrictions and a sensitive digestive tract including all 8 amino acids needed to complete protein for energy and proper metabolic glandular support! Great to take by itself on busy days or combine with other supplements as a foundation when special needs exist or to optimize health including; WL Aloe Vera Juice Concentrate, Daily Greens, Fiber Mate (encourages regularity), Probiotics, Fish Oil, and other antioxidants, etc. There is a BIG difference in Multiple Supplements - Use the Best By Aloe Life for 3 Months and You Be the Judge! *Iron toxicity effects many adults with symptoms of headaches etc. that negatively effect ones health. If so desired an iron supplement can be added or the Daily Greens Formula by Aloe Life (2 mg per serving). I love this multi and my husband and I take it every morning. We also take it with b complex stress formula. It gives me so much energy that if I happen to rush out of the house without it I could notice the difference and realize oh no I forgot to take my multi. I don't want to be without it!